One Girl Can is on a mission this holiday season to build a new #HomeForTheHolidays. This Vancouver-based organization empowers girls in Africa through education to end the cycle of poverty and gender inequality. Their holistic model supports a girl from the time she leaves primary school until the day she gains meaningful employment. 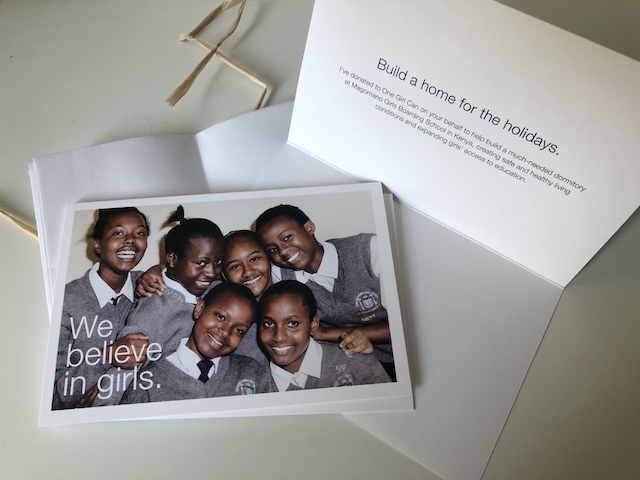 The goal of the holiday campaign is to raise $10,000 to build a new dormitory for their students through the sale of holiday cards. Card printing was generously donated by Hemlock Printers, so 100% of card proceeds go directly towards the building project. As part of GivingTuesday, on November 27th One Girl Can are proud to be partnering with AG Hair, who will match all donations and holiday card purchases made throughout the day, doubling the impact of all donations. A 5-pack of cards is $25 and a 12-pack is $50. A 15% discount is available for purchases over $100. Follow One Girl Can on Facebook, Twitter, and Instagram for more information.